Let it be said: I am no laundry role model. I do not do it often enough, and when I do I have to take it to the nearest (cheapest) laundromat about 6 blocks away and either a) walk by the tourists at Cheers or b) walk through the Public Garden. Not only is it farther than I'd like to walk but also those are not the two places I'd like to go through with a big bag topped with my underwear. Also because I do not do it often enough I always have a ton of it to carry when I do. It's heavy. I'm on a 5th floor walk-up. All of this is to say, the last thing I want to do is also lug around a big jug of detergent. My simple solution: use a smaller container. I know this isn't revolutionary, but it didn't come to me for a while and now that it has, I'm not looking back. 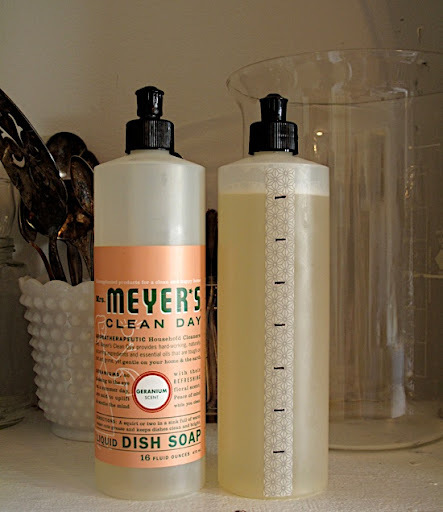 I took an old dish soap bottle and removed the label (you'll have to get some goo-gone action on). Next I put a length of (pretty) tape down the side. I took my detergent and poured it in the cap to get the measure for one load. Pour that into your bottle and mark the amount. Record the length of that measure and repeat it up the side of the tape. BAM. Look how many loads I'll get before I even need to refill it. Laundry: a teensy, weensy bit better. Getting your goo-gone action on! yes! ha ha ha! I have also realized that I like carrying my laundry accoutrement in smaller bottles, but I never turned those vessels into something fancy like this! New reader here (followed a link to your antiquing a leaded glass window into a mirror post - must try! ), so I apologize if you've already covered this; Where do you get the pretty tape?